Most high-end smartphones rarely offer more than 128GB of onboard storage. The iPhone 6 maxes out at 128GB and so does the Galaxy S6 and S6 edge. The problem is that while everybody likes more storage some one of them are just not willing or able to pay top dollar for a top of the line flagship smartphone. Samsung sees an opportunity here which it’s going to plug with its new high-performance mobile memory storage based on eMMC 5.0 technology. 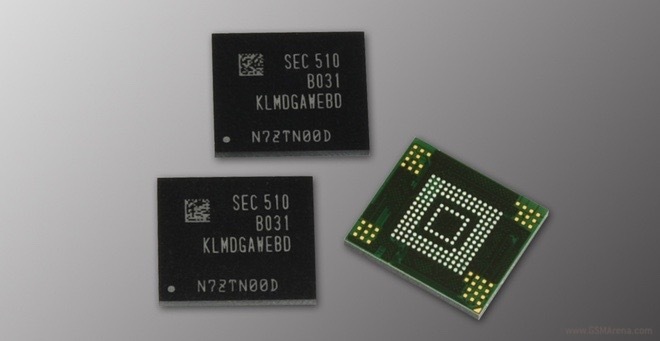 The 128GB 3-bit NAND-based chip is primarily targeted at “mass market” smartphones and tablets. That’s just a fancy way of saying that this chip is meant for affordable mobile devices. The Korean giant’s new storage is capable of 260MB/s for sequential data reading – the same performance level as eMMC 5.1 memory. Random data read and write operations of 6,000 IOPS and 5,000 IOPS respectively are also possible on the memory. The component’s IOPS speeds are up to ten times faster than those of a typical microSD card. Samsung’s new affordable flash storage is capable of easily handling HD video processing and multi-tasking. The only thing Samsung didn’t mention in today’s press release is when it will start mass producing this new chip. Once it starts shipping the chips to OEMs we will starting seeing devices in the mid-range market offer up to 128GB onboard storage. We don’t know what device will Samsung’s new memory chip debut into. A high-profile mid-ranger from the Korean manufacturer seems like a solid candidate for the honor.